By the time Lorraine Hansberry died in 1965 at the tender age of 34 from pancreatic cancer, she had already made history. 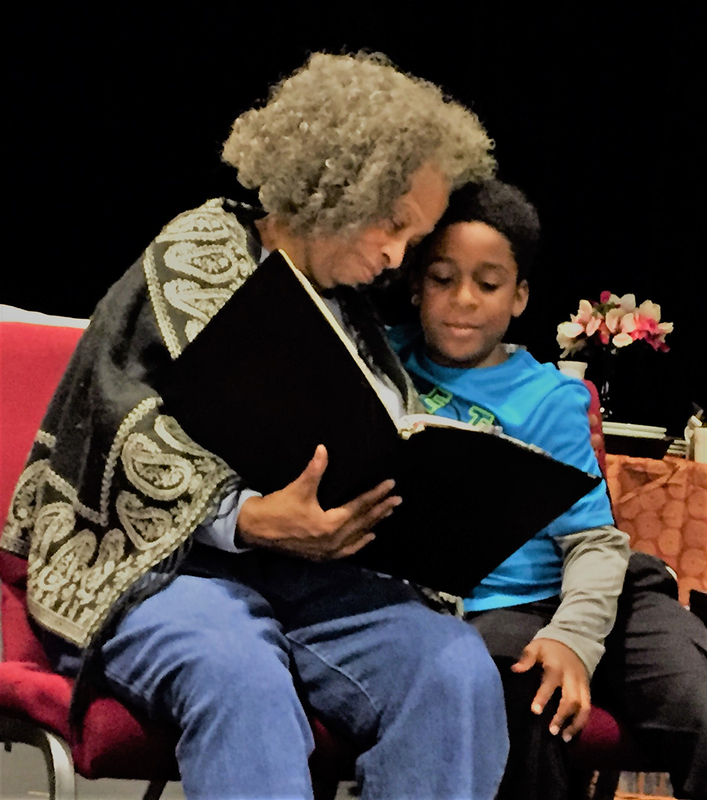 Her award-winning play, A Raisin in the Sun, about an African-American family attempting to move out of a redlined slum and into a well-to-do white neighborhood was the first play written by an African-American woman to open on Broadway. 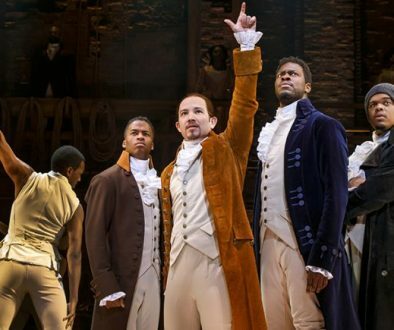 Although the play did not win a Tony Award (it lost to William Gibson’s The Miracle Worker), it did merit the first New York Drama Circle Desk and Drama Desk Awards for an African-American. Hansberry remains the youngest American to be so honored. 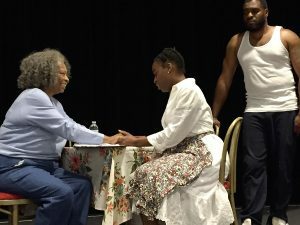 In celebrating its 60th anniversary this year, Voices in the Dark Repertory Theatre Company is presenting the first local production in some time. Helmed by director Tommye Myrick, the cast of nine performers is outstanding, led by the irrepressible Carol Sutton. Sutton gives a brave performance as matriarch Lena Younger, the head of the clan who comes to see homeownership as not only a way out of an overcrowded apartment, but as a sign they have achieved a small part of the American dream. Surprisingly, Sutton has never played the role before, which is a shame because it is a part she was seemingly destined to play, a performance of a lifetime with a strong, supportive ensemble of fellow actors. Sutton’s ability to interface with all of the other cast members is so natural and generous that it vastly enhances this production. Her angst and despair at dealing with life and her family’s tribulations are laid out like wooden planks on a dusty road for all to see. She has great hopes for her family, but at first is suffocating in the application of her love. 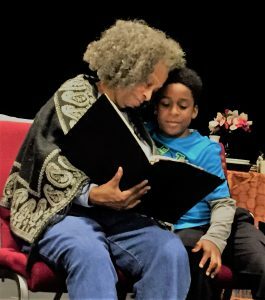 Her most heartrending moments on stage are spent with Michael C. Forest, who plays her son Walter Lee Younger. 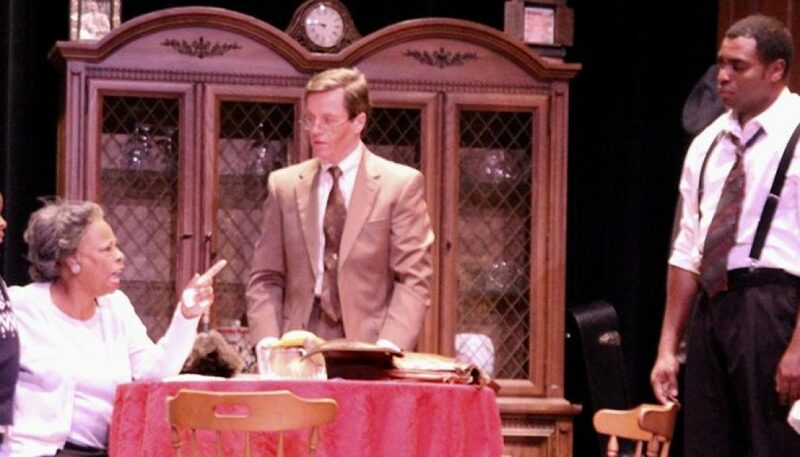 Walter Lee is a self-loathing chauffeur who wants to become a liquor store owner and provide for his young wife and son, but he pins his hopes for the family’s future on the $10,000 beneficiary death benefit insurance check due to arrive at the play’s start. A photo of the late actor, mentor and director John O’Neal prominently graces the set and serves as the effigy of the recently-deceased father figure. Walter Lee subsumes himself in the belief that this blood money is his only means towards gaining economic freedom for his dependents and salvation for himself. Forest’s characterization is full of wrath and self-pity. He spends so much time in pursuit of the shortcut to his dream that he fails to see how the process is actually destabilizing his happy home and keeping everyone on edge and apprehensive. The anxiety in the household can be cut with a knife, especially reflected in the hopelessness expressed by his wife Ruth Younger (Constance Thompson), who sees an unexpected pregnancy as a curse rather than a blessing. As the youngest member of the Younger clan, Ellington Benoit plays Travis, a smart and sensitive child, who is above all else adaptable to his crowded habitat. He possesses an innate charm in easily playing off his loving grandmother and beleaguered father, sleeping on the couch with no expectation of privacy. As Beneatha Younger, Ebony Duely Johnson also expresses a desire to better herself and help others by becoming a doctor. She is also in the bloom of her youth, coming into womanhood as a proud member of her race and searching for a way to express her own identity. As one of two suitors, Christopher Robinson portrays George Murchinson, a proud black university student with shoes as white as the subservient and demeaning trappings of what he offers Beneathea. 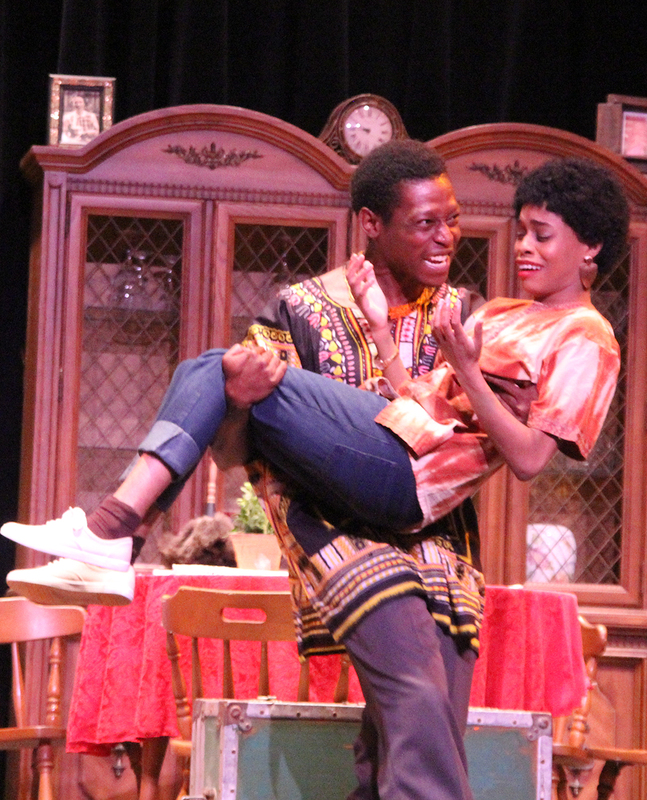 Martin “Bats” Bradford, as Nigerian exchange student Joseph Asagi represents a way for Beneathea to break free and hearken to a call back to her African roots. Bradford tackles this small role with his usual intensity and the scenes with Johnson are especially satisfying as she is immersed in his native culture. As Karl Lindner, the representative of the Clybourne Park Improvement Association, Jim Holmes is the insidious racist who attempts to block the Younger family from making a move into his all-white neighborhood. He insists he is there to help them, but his intentions prove otherwise and the folly of his exercise is exposed as a last-ditch effort steeped in the bitter tea of hatred and discrimination. Walter Lee’s buddy, Bobo (Tracy B. Mann) completes the cast of players. Bobo is a stereotypical example of an intemperate sloven who fills Walter Lee’s head with unrealistic expectations and his belly full of beer. The set design by Dane Rhodes (he is also responsible for the lighting design) is nothing short of remarkable. 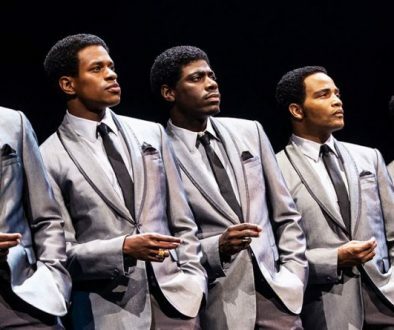 The costume designs by Yvette Hough also work extremely well in helping to shape the development of the onstage characters. 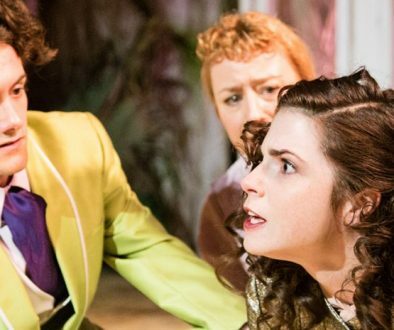 In Sutton, Myrick has cast an ideal choice of a strong leading lady who knows how to lean into her character and give the emotional support needed for the other cast members to turn in marvelous performances. Myrick’s experience as a director gives this, the first of three major productions slated for the Ashé, a rich sense of continuity and a feeling that Hansberry’s characters have truly come alive from the printed page to the stage. 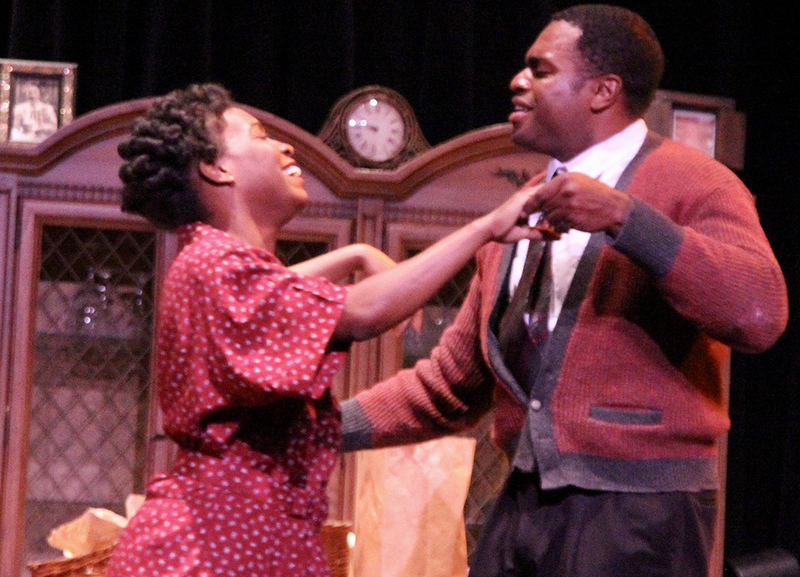 A Raisin in the Sun, a joint production of Myrick’s Voice in the Dark Repertory Theatre and the Ashé Cultural Arts Center, continues at the Ashé Power House Theater, on March 21-23 and also from Fri., March 29-30 at 7:30 p.m. Matinees at 3:00 p.m. will be on Sundays, March 24 and 31. Tickets are available at 504-569-9070.